Check out these fantastic Designer Con 2018 Exclusive Larry Lactose Resin Figures by Andrew Bell! 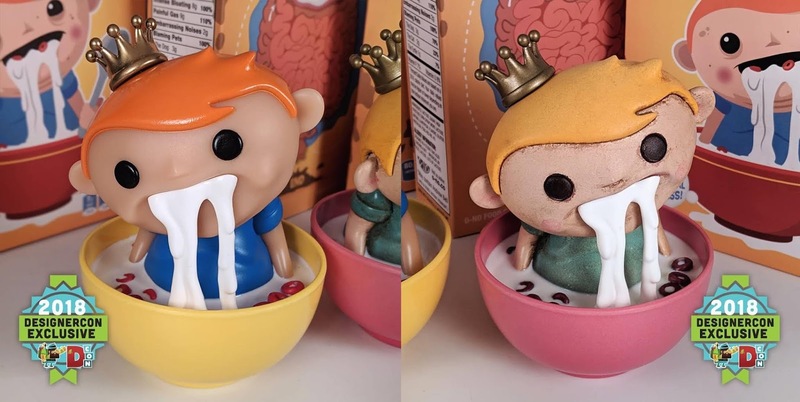 Inspired by Funko’s Freddy Funko and their bizarre new line of FunkO’s cereal, Larry Lactose is a 100% handmade resin figure and is available in two colorways: Regular Edition and Vintage Edition. This kinda creepy figure stands 6” tall and includes a magnetic crown. Collectors can purchase this lactose intolerant creation this weekend exclusively at Andrew Bell’s DCon booth #108.